The huge Kaneohe embayment is the largest sheltered body of water in the entire Hawaiian islands. Don’t miss this amazing natural feature, with extensive coral reefs including one of only two barrier reefs in these islands. 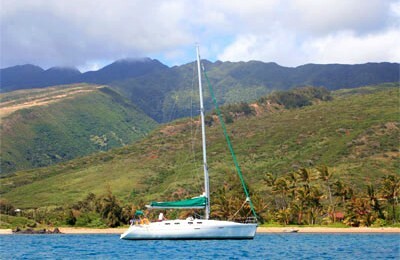 Enjoy amazing snorkeling in Kaneohe bay, and spectacular views of Koolau Mountain, Chinaman’s Hat and Coconut Island. Turtle sightings are almost guaranteed!. 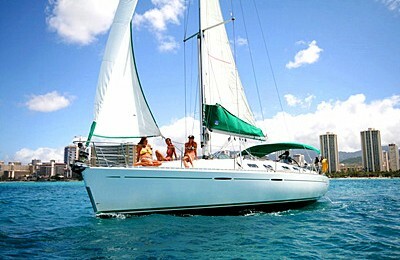 shallow draft, forty-two foot power catamaran is perfect for going to the famous Kaneohe Bay sandbar. Even better, you can invite up to 24 total passengers and have the most fun you can have for this price. So bring all your friends and loved ones, pack a picnic. Bring your own wine and beer in moderation is allowed. This boat comes with snorkel gear and life vests. Protection from the tropical sun cannot be over emphasized. In fact, T shirts are best, or, use environmentally compliant sunscreens so as not to damage the delicate reefs. This boat also has an awning to provide shade. Boarding at Heiea Kea Pier in Kaneohe, Oahu. (30 minute drive from Honolulu). Free parking. Price includes all taxes, harbor fees, and tips. 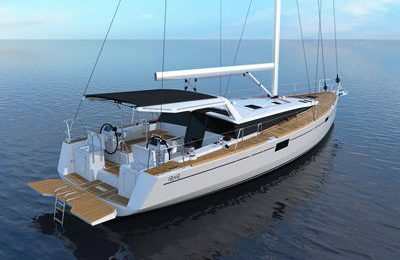 A 42 foot power catamaran with a shallow draft, perfect for approaching the sand bar. Equipped with under shaded area, and a head(restroom).